Technological advances have multiplied the flooring options for basketball. Previous generation of players competed indoors on wood, tile or tartan surfaces and outdoors on either concrete or asphalt, but new synthetic surfaces and sports court technologies have created a whole new range of choices. Players have myriad selections of sneakers and basketballs, too, creating thousands of variables. Some surfaces present greater performance, some offer greater player safety and some offer a solid combination of both. Basketball is a game full of starts, stops, accelerations and cuts. Traction is paramount. Most of the newer synthetic courts offer great traction -- which can include seamless tiles, poured or rolled surfaces. Indoors or out, the upkeep usually is easy. Outdoor concrete and asphalt courts offer great traction, but asphalt can tear up shoes, basketballs and skin. 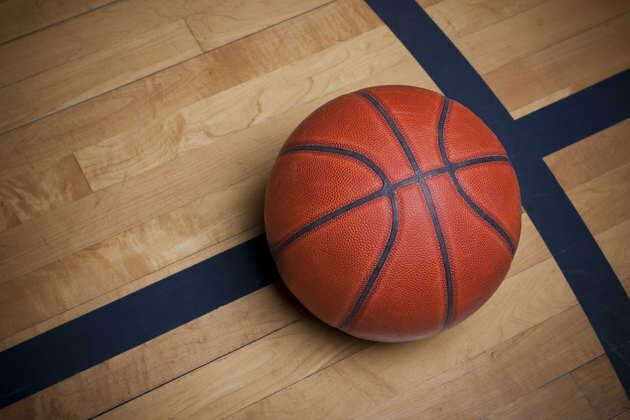 Traditional hardwood indoor courts can offer great traction if properly maintained, but wood, tile and other old multipurpose surfaces can become dangerously slick if not properly maintained. Harder wood surfaces offer the true bounce that players and coaches prefer, but AthleticBusiness.com reported that softer wood floors are easier on athletes' legs. Concrete and many of the new synthetic surfaces offer a true basketball bounce. Some engineered surfaces offering more "give" for the players might deliver less bounce for the basketball. A worn asphalt court can cause erratic bounce, as can a worn wood court with dead spots. Players find that softer wood floors are much easier on the legs and maple flooring tends to offer the most give. Temporary wood courts used for NBA games in multi-sport arenas tend to have a great deal of give. An engineered athletic surface using scrap rubber could replicate hardwood performance with even greater safety. Playing on harder surfaces like tile, concrete, asphalt, tartan surfaces and some newer synthetic surfaces with less give can lead to "jumper's knee," or patellar tendinitis. Playing on surfaces with extreme traction, like rubberized floors, can increase ankle sprains, knee sprains, turf toe and other injuries familiar to football players competing on older-style artificial surfaces. Choosing the right basketball shoe and keeping the out-soles of those shoes clean can improve safety and performance. Basketball puts tremendous strain on ankles and knees, and matching shoe to surface is as important in basketball as it is in football. Wearing worn-out shoes increases injury risk. Many professional players change their shoes weekly or from game to game to maintain maximum performance.